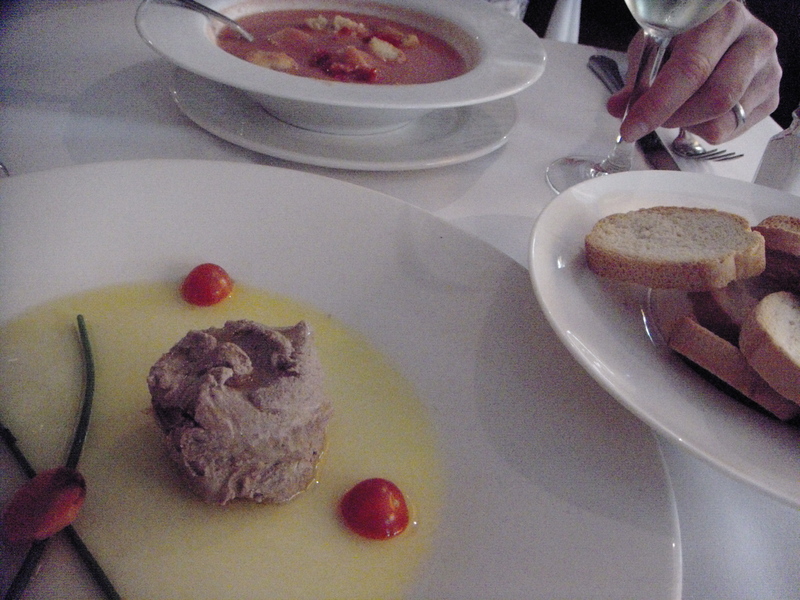 Pate and gazpacho at La Finca de Susana. In stark contrast to Saturday, today (Sunday) was near-perfect: Yesterday dawned cold, rainy and dreary; this morning was crisp and sunny. Yesterday’s walk along the Paseo de Prado began amid lush greenery but veered into the harsh concrete of Nuevos Ministerios; today’s expedition through the Parque del Buen Retiro was idyllic start to finish. Yesterday’s afternoon meal was a hastily chosen, overpriced, mostly bland filler on the Plaza Mayor; today’s main meal was sophisticated, delicious and affordable. After our now-habitual breakfast buffet, we set out to erase yesterday’s shortcomings. Our walk led us to Madrid’s well-manicured version of Central Park where we spent several hours amid the maze of rose bushes and trellises of the Rosaleda (rose garden), the peacock party in the Jardines de D. Cecilio Rodriguez, the park’s central lake thronged by families and brimming with rowboats, and surrounding neighborhoods. Afterward, we ambled west in search of a friend-recommended restaurant: La Finca de Susanna near the Sevilla metro stop. La Finca had a line forming at 2 p.m., so we added our name to the hour-long wait list and headed around the corner to a cafe with a pastry-laden front window. Hontanares has a coffee-shop vibe but a taberna menu. We sat at the counter, ordered wine and olives from the genial tabernero and recounted our walk. We were tempted by toasted bocadillos, meat- and cheese-filled pastries and more tapas, but did our best to avoid filling up before our scheduled meal. At 3, we returned to the bright yellow awnings that mark the exterior of La Finca de Susanna. The interior is a study in bustling efficiency. Putty-colored walls, oversized black-and-gold barrel chandeliers and wall of wine are markedly contemporary, while rustic wood floors, crisp linens and palm-flanked windows give the space its namesake country-house feel. The menu’s hearty Mediterranean and Spanish dishes make ordering a challenge. We started with a refreshing gazpacho laced with minced onions, red bell peppers and crunchy croutons; and a creamy chicken-liver pate enhanced by fruity olive oil. Hot fresh-baked bread did sopping duty as we awaited our entrees. J’s succulent braised pork ribs arrived accompanied by perfectly cooked couscous. My lamb shoulder, falling off the bone and bathed in a earthy pan juices, was complemented by sweet caramelized baby onions. We finished our two rather large plates, but dessert was out of the question — though a rich-looking wedge of chocolate torte sent to neighboring tables flirted with us briefly. Next time. A beautiful day capped by a satisfying meal — a perfect Easter Sunday. We dedicate today’s meal to Julia y Pedro, the patron saints of the weekend “linner.” Mwah. Thank you for your sweet dedication of your linner and on our anniversary! we also had linner out to celebrate. your pork ribs and lamb shoulder sounds devine. thank you for the posts! keep ’em coming!